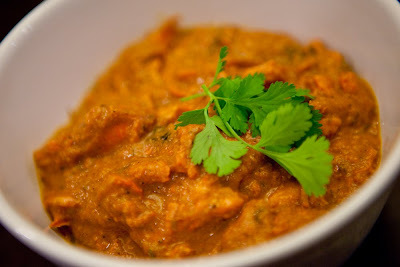 As I'm looking at the picture of Butter Chicken, thinking of what i should write in this blog, all i can think about is the rich, creamy flavor. It's like i can almost taste the chicken just by looking at it! I do keep forgetting to mention that all the pictures of my food are taken by my dear husband whose passion is photography. So thanks alot for these wonderful picture! Alright, back to the chicken. So growing up, my mom never made butter chicken at home. And the only time we'd have it is if we went to an Indian restaurant . I like butter chicken but never really had it where it just blew me away. Not until one year, when i was back home in Singapore, visiting my family. My dad's cousin had me over for dinner and she made this delicious butter chicken. All i could think the entire time and the rest of the week was the butter chicken. The flavors, tenderness of the chicken and the yummy sauce. It was just right! I knew i wanted the recipe and to also see how it was prepared. I called my aunt, and she was so nice to share this recipe with me and have me over again so i can see how it was made. I have to say it isn't the healthiest but which Indian dish isn't?? I've made this many times and it's always been a hit. For those of my friends who've had it, you know what I'm talking about! So here's the recipe :). 2. Apply a mixture of red chili powder, lemon juice and salt to the chicken and leave aside for 15 min. 3. Hang the yogurt in a muslin cloth for 15-20 minutes to remove extra water. Add red chili powder, salt, ginger-garlic paste, garam masala powder, tandoori masala, oil and red colour. 4. Apply this marinade to the chicken pieces and refrigerate for 4 hours or more. 5. Cook this chicken in pressure cooker on low heat for 15-20 min. Do not add water. When cool, open the cooker. If there is too much water, boil it away on high heat till dry. Let it cool. Reserve the gravy and use it in butter chicken sauce later. 6. Break up the chicken into small boneless pieces. 7. Heat 1 tbsp butter in a non-stick pan. Stir-fry the chicken pieces on high till a little browned. Do this in 2 batches. Remove and keep aside. 1. Quarter tomatoes and chop onions into big pieces. Put into pressure cooker. Do not add water. Cook for 10 min. on low. When cool, open the cooker. If there is too much water, boil it on high to reduce the water. Remove and cool. Blend in a blender and then pour mixture through a sieve to get a smooth sauce. It should look like a thick sauce. 1. Heat 2 tbsp butter and 2 tbsp oil in a pan. Add bay leaves, elacho and cloves. Then add ginger, garlic and chili paste, red chili powder, garam masala and salt. Cook for 1 minute or till dark brown. 2. Add sauce. Bring to a boil. Reduce heat and simmer for 10 minutes. Add sugar or lemon to get desired taste if necessary. Add red colour if necessary. 3. Add cooked tandoori chicken pieces. Simmer for 5 minutes and then add kasoori methi (crushed), fresh chopped coriander and whipped cream. Mix until all ingredients are stirred in well. 4. Serve hot with naan or paratha.